We were not created to just get by with average, unrewarding or unfulfilling lives. God created us to leave our marks on our generations. Every person has seeds of greatness planted within by the Creator. In his #1 New York Times bestselling book, Break Out!, Pastor Joel Osteen reveals 5 keys for living that focus on moving beyond barriers. 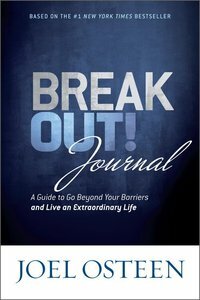 Now, Joel Osteen offers a practical tools and guided help for readers to break out and break free so they can believe bigger, increase their productivity, improve relationships, and accomplish their dreams. In using this journal, you will find yourself challenged daily by insightful reflection questions, motivated by a specific call to action, and inspired by a relevant Scripture verse-all of this with space in which to record thoughts and revelations.